DJ Harper, RB- Harper looks like a solid back to me. He is compact like Doug Martin was, though he isn’t as strong and isn’t as good. He is listed at 5’9”, 205 pounds and has more than enough leg drive and strength to run through arm tackles and demonstrates this consistently. In watching some highlights and clips of him earlier in his career it seems that, not surprisingly, he has lost significant explosiveness and top-end speed as a result of his two ACL injuries. He still has some burst and can make subtle cuts without losing speed, but I don’t think he’s going to run any faster than a 4.5 in the 40. He has experience pass blocking and is solid in that department and isn’t a bad receiver out of the backfield either, but his injury question marks are serious ones and that will hurt his stock. To me he is a mid-late day 3 pick that has a chance to stick, but isn’t going to be a quality starter at the next level. Matt Miller, WR- Matt Miller is the name of a NFL Draft analyst (@nfldraftscout) but he is also a sophomore wide receiver on Boise State’s offense. He has been their most productive receiver this year as the 6’3”, 215 pound wideout produced 60 receptions, 679 yards and 5 touchdowns. He may be matching up with Desmond Trufant today, so I’m interested to see how he does. Holden Huff, TE- Huff is Boise State’s leading receiver at tight end despite only being a freshman. He’s listed at 6’5”, 213 pounds so he is essentially just a really big receiver at this point, but as he fills out his frame he could become a very intriguing joker tight end prospect. He only had 15 receptions, 215 yards and 2 touchdowns, but he is still only a freshman. Keep an eye on him in the future. Demarcus Lawrence, DE- Lawrence and Ukwachu are two players I am very excited about. Lawrence is only a sophomore but he led Boise State in tackles for loss and sacks this year, his first with the program. He has 8.5 sacks, 5.0 TFL, 4 forced fumbles, 1 fumble recovery (returned for a TD), an interception and a blocked kick. He is listed at 6’3”, 242 pounds and has some burst off the ball. I haven’t seen enough of him to have a great feel for his game, but he stuck out to me immediately when I watched Boise State a couple weeks ago. He’s may already be their best defensive player already despite only being a sophomore. ****UPDATE**** According to @IDS_BroncoBeat Lawrence has been sent home for a violation of team rules and will miss the bowl game against Washington. This is Lawrence’s second suspension. Huge loss for Boise State and concerning for such a talented player. Samuel Ukwachu, DE- Ukwachu stuck out to me just as quickly as Lawrence did and he is only a freshman. He is listed at 6’4”, 222 pounds and had 4.5 sacks as well as 2.5 TFL, 1 forced fumble and one pass break-up. He’s not a starter yet, but he is explosive off the ball and seemed to have impressive length when I saw him earlier this year. These two are going to be a dynamic pass rushing tandem for the next two years if Lawrence stays in school until he’s a senior. If not, next year they could be one of the better young tandems in the country. Ricky Tjong-A-Tjoe, DT*- I haven’t paid attention to Tjong-A-Tjoe much when I’ve watched Boise State, but his name alone is intriguing. Add in the fact that he is an athletic 6’2”, 296 pound defensive tackle and the fact that he is only a junior who is originally from the Netherlands and I’ll definitely be keeping an eye on him today. He’s flashed burst off the ball, some intriguing hand usage and he seems to have a good motor. I’ll be keeping a close eye on him today, but it seems that Boise State has certainly reloaded as far as their defensive line talent is concerned. JC Percy, ILB- Percy is an undersized linebacker that likely won’t be a NFL Draft pick, but the 6’0”, 227 pound middle linebacker is a productive tackler who may not be a fantastic athlete, but could contribute on special teams and perhaps as a back-up linebacker at the next level. If he doesn’t make a NFL roster I think he may get CFL looks. Jamar Taylor, CB- Taylor is a potential top 100 draft pick for Boise State. He is listed at 5’11”, 196 pounds and as far as I know he hasn’t been invited to the Shrine Game or the Senior Bowl yet. That surprises me a little bit, but hopefully he will be at one of them. I’m not that familiar with his game, but he is one guy I am definitely going to keep an eye on today. He is likely Boise State’s top 2013 prospect. Darian Thompson, CB- Thompson is only a freshman but he has a lot of upside in my opinion. He’s listed at 6’1”, 197 pounds, he had 25 solo tackles this year, 3 pass break-ups, 3 interceptions and a fumble recovery. This will be my first game to really key on him, but I’m excited to see if he gets to match up with Kasen Williams at all today. They’re both talented young players, so keep an eye on Thompson. Keith Price, QB*- Price was a popular name as he took the Pac-12 by storm as a sophomore last year and capped it off with a terrific performance against Baylor’s pathetic defense in Washington’s exciting loss in the Alamo Bowl (video courtesy of @jmpasq, follow him on Twitter). This year he has underwhelmed and it is reflected in the win column for Washington and on Price’s personal stat sheet. He doesn’t have great arm strength, though I do think it is above average, as is his accuracy. He looked like a potentially special player last year, but he has come back down to Earth this year. He’s athletic and he has a flair for the improvisational play, but his decision-making could use improvement and while he still has a year of eligibility left it’s hard to project him as anything beyond a Day 3 pick at this point. Still, he has more than enough talent to be a quality college starter, and if Boise State sleeps on him he could surprise them with a performance reminiscent of his game against Baylor last year. He’s got plenty of weapons to choose from, most notably Austin Sefarian-Jenkins and Kasen Williams. Bishop Sankey, RB- Sankey is a player that I am not at all familiar with, but in replacing Chris Polk this year the 5’10” 200 pound sophomore has produced 1,234 rushing yards (4.76 ypc) and 15 touchdowns as well as 175 yards on 27 receptions through the air. If Boise State can slow him down it will make Washington one dimensional and put a lot of pressure on Keith Price to carry the load, but if Sankey makes plays and Boise State has to put an additional safety in the box Price is going to take deep shots down the seam to Sefarian-Jenkins and on the outside to Kasen Williams. 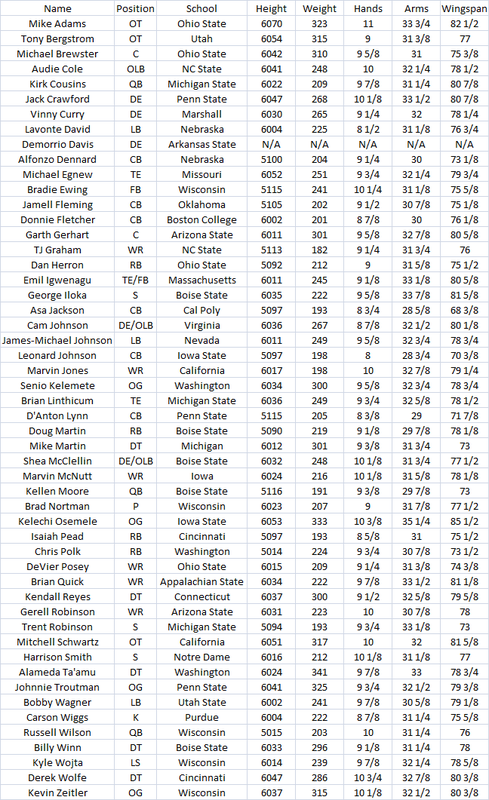 Much like Polk was last year, Sankey is the cog that makes this offense go. Kasen Williams, WR- Williams is a sophomore receiver that I really, really like. He is listed at 6’2”, 216 pounds and he has impressive athleticism, hands and he has been making plays since he was a freshman last year. He has 6 touchdowns this year (matching his production as a freshman) and he gives Washington a dynamic duo of pass catchers between himself and Sefarian-Jenkins. They’re both future NFL Draft picks, though ASJ will likely go higher. Still, Williams is a very impressive talent and I can’t wait to see him against Jamar Taylor today. Austin Sefarian-Jenkins, TE- Sefarian-Jenkins, or “ASJ”, is the best tight end in the country. I love Tyler Eifert, but ASJ is better in my opinion. He isn’t eligible for the draft this year, but I think ASJ is going to be a 1st round pick next year barring injury and he reminds me so much of Tony Gonzalez. He stuck out immediately when I watched Washington last year to get a look at Chris Polk and he has become incredibly popular ever since. I’d like to think I was one of the earliest on his bandwagon, but regardless of how early I was or wasn’t a fan of his it’s blatantly obvious that he is a very special talent at tight end. He is a player that Boise State just won’t have an answer for on defense and if Washington wants to win they need to get him the ball early and often. Josh Shirley, DE/OLB- Shirley is a player that stuck out a lot against Baylor and RGIII last year and he has a lot of explosion off the ball to threaten the edge with the speed rush. I’m interested to see how Boise State deals with the talented sophomore because he could give Southwick a lot of problems off the edge. He’s undersized at 6’3”, 230 pounds though so if you run at him you can wear him down. I imagine that is the gameplan for Boise State today with DJ Harper. He has 15 sacks the past two years (6.5 this year) though, so don’t be surprised if he gets another one today. Andrew Hudson, DE/OLB- Hudson is a player I’m not as familiar with as Shirley but he is a talented pass rusher as well. He’s more filled out than Shirley at 6’3”, 249 pounds and registered 3.5 sacks as a freshman before totaling 6.5 this year to tie Shirley for the team lead. These two are both just sophomores but they have plenty of upside and I’m very interested to see them play against a balanced offense like Boise State today. If they can hold up versus the run and put some pressure on Southwick they will have a chance for an upset. Danny Shelton, DT- Shelton is yet another talented sophomore on Washington’s defense, but Shelton has been tasked with replacing Alameda Ta’amu after he graduated last year, leaving a gaping hole at nose tackle (literally). Shelton is still very young, but the squatty 6’1”, 317 pound defensive tackle played a key role in upsetting Stanford earlier this season and if he continues to progress he is going to be a very appealing 3-4 NT at the next level. He hasn’t offered a ton of pass rush thus far, but if he can plug up the run and force Boise State into 3rd and longs Washington will have a great chance at an upset today. Desmond Trufant, CB- Trufant is a talented senior corner with a NFL lineage thanks to his brother Marcus. He will likely be a Day Two pick (2nd-3rd round) and I am looking forward to seeing him today and in person at the senior bowl. He is Washington’s top NFL prospect, so I am looking forward to seeing him match up with Kasen Williams on the outside today. He’s listed at 6’0”, 186 pounds and has NFL caliber athleticism and is a talented man coverage corner. He only has 7 pass break-ups and 1 interception this year, but that likely has to do with teams avoiding him and testing other Washington corners instead. He has impressive ball skills and looks like a quality NFL starter to me. Sean Parker, S*- I’m not very familiar with Parker’s game, but he is one of the Huskies’ starting safeties and he has a knack for coming up with interceptions. He has 7 in his young career, including 6 the last two years (2 this year, 4 as a sophomore). He is listed at 5’10”, 190 pounds and is from Los Angeles, California but has been overshadowed by the dynamic talent of Shaq Thompson this year. I think Parker has some talent of his own though, so I’m interested to see how he does today. Shaq Thompson, S- Plenty of people are familiar with Thompson, but in case you aren’t he was one of the best players in California and one of the best safeties in the nation coming out of high school and he has predictably made an immediate impact as a true freshman this year. I hope you’re sitting down, because the 6’2”, 215 pound safety has 66 total tackles (40 solo, and he packs a punch as a hitter), 6.5 TFL, 2 sacks, 3 pass break-ups, 3 interceptions, 1 fumble recovery and a blocked kick. Don’t be surprised if this dynamic safety is making plays all over the field today. However, he is still young, so it will be interesting to see if he makes any freshman mistakes against a historically disciplined Boise State team. Doug Martin, RB, Boise State: Martin proved to be the top back all week, and while he didn’t have great numbers in the game he showed the ability to hit the hole quickly with his burst, catch the ball out of the backfield and make critical blocks in pass protection. He probably won’t go in the 1st round, but if you need a running back in the early-mid portion of the 2nd round Doug Martin should be very high on your board. Bradie Ewing, FB, Wisconsin: Might not seem like the most likely riser, but Ewing has been an effective blocker all week and he can catch the ball out of the backfield better than most give him credit for. He made a pretty lucky but impressive reception downfield against Zach Brown today, and he has NFL starting fullback written all over him. Marvin Jones, WR, California: Jones came into the game under a lot of radars, and I personally didn’t have much more than a 5th round grade on him, but he was consistently good all week and may have really boosted his stock. He looked like he may be a solid #2 or #3 receiver in the NFL, and likely prompted a lot of evaluators (including myself) to go back to their California tape and take a closer look at him. TJ Graham, WR, North Carolina State: I’m not sure I saw Graham drop a ball all week, though I wasn’t always focused on him during practices. He’s got great speed, he’s very explosive as a receiver and as a return man, and he consistently ran good routes this week. He had a few nice catches in the game today and had a pretty nice kick return as well. I think Graham warrants 3rd round consideration. Joe Adams, WR, Arkansas: I noticed Adams’ explosiveness last year when I was scouting Ryan Mallett and his explosiveness has really helped his stock since then. He seems to make a guy miss every time he gets his hands on the ball, and in a league that is always looking for big plays and yardage after the catch in passing game Adams could be in high demand. I have heard rumors that he might go as high as the late-1st if he runs well. I don’t know about that, but i think the 2nd round is very realistic at this point. His potential as a slot receiver, as a guy who can run reverses and contribute as a return man will help him a lot. He should run in the 4.3-4.4 range at the combine, and I think that could boost him from the 3rd round to the 2nd round if he does. Mike Adams, OT, Ohio State: Adams proved to be the top offensive tackle on either roster for the whole week in my opinion, and while I don’t think he will be a very good run blocker at left tackle or at right tackle, I do think he has the size, athleticism, length and talent to play left tackle in the NFL. That’s a highly coveted position, and he looked good against Vinny Curry all week in practice while in contrast the South offensive line couldn’t keep him from generating consistent pressure on Saturday. He should be a first round pick, and may be the #3 offensive tackle off the board. Cordy Glenn, OT/OG, Georgia: Glenn came into the week neck and neck with Kelechi Osemele as a RT or OG prospect, but Glenn proved that he was the more versatile player consistently this week. He was the only offensive lineman on the South who won match-ups with Quinton Coples in 1 on 1 drills this week and was the only South offensive lineman who slowed down Vinny Curry in the game on Saturday. He bends at the waist a bit, but not a lot, and has shown that he can play left tackle in a pinch. He should be able to stick at right tackle or at guard and be a quality NFL player. Quinton Coples, DE, North Carolina: Coples came into the week on the heels of a disappointing senior season in which he was reportedly playing to not get hurt. He left a lot of people wondering where the seemingly dominant junior player had gone, but he reminded everyone what he was capable of all week. He was almost unblockable in 1 on 1 drills, and played the run pretty well during the week and in the game. He could be a very dangerous left end in the NFL in my opinion. Some were questioning whether he should be a 1st round pick at all coming into the week, but I think Coples answered those questions. There are still red flags around his game, and some have wondered if he will be a “contract year” player at the next level that has his best season the year before his contract expires to get a big pay-day before his play regresses after he gets his signing bonus. That is certainly possible, but there’s no doubt Coples has as much potential as any defensive end in this draft. Derek Wolfe, DT, Cincinnati: Wolfe came into the week as a relative unknown but he left the week having opened people’s eyes, and may end up in the top 100 come April. He’s got good size, length and showed the versatility to play the 3-tech and the 5-tech this week, and even won some match-ups rushing from the 4-3 defensive end position in 1 on 1 drills. He’s got starter upside in the NFL, and I think he is well worth 3rd round consideration. Bobby Wagner, ILB, Utah State: Wagner came into the week under the radar as well because he is from a smaller school, and even though his height wasn’t a highlight at the weigh-in it was clear that he was absolutely jacked. He played well all week and capped it off with a great performance in the game with 7 total tackles, 1 TFL, 1 INT and 1 pass deflection. He’s an impressive player who is definitely on the rise, and projects to both the 4-3 and 3-4 defense at the middle linebacker position. That’s critical for him in what many consider a weak MLB class. Janoris Jenkins, CB, North Alabama: Jenkins, like Coples, came into the week with some questions around him. He obviously had to leave the Florida program (he actually had a Florida sticker on the back of his North Alabama helmet in the game) and many people were willing to discount his performance in his senior season saying it was unimpressive. Be that as it may, there was no doubt in my mind how talented Jenkins was and he showed everyone what he was capable of this week looking like a 1st round pick from beginning to end. He should end up in the 1st round, especially if he interviews well. It will be interesting to see where he ends up going. Casey Hayward, CB, Vanderbilt: Hayward was a bit under the radar as well but he had a pretty good week for himself. He’s a top 100 player without question and his ball skills are some of the best in the draft at cornerback. He’s going to be a NFL starter in a couple years and I think he proved that this week, so look out for Hayward at the next level. 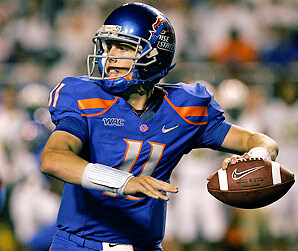 Kellen Moore, QB, Boise State: If you followed my Senior Bowl tweets or anyone else’s, chances are you heard bad things about Kellen Moore this week. He measured in at 5’11” at the weigh-in, he looked like a high school kid that had never really lifted weights, and his arm strength and release attracted a lot of scrutiny this week. He doesn’t have a NFL arm, and I don’t think he has starter upside at the next level, but I would be surprised if he went all seven rounds without hearing his name called. His college production and his intangibles should assure him a NFL Draft selection, but he definitely didn’t help himself this week. Dwight Jones, WR, North Carolina: Jones came into the week at the top of some Senior Bowl WR rankings, and I saw a couple people that even had him graded as a 1st rounder and up around Justin Blackmon and Kendall Wright on their boards. I certainly disagreed with them throughout the week, and I didn’t see anything this week that would have changed my mind. He struggled to create separation with his routes, was inconsistent catching the ball, and generally looked like he did on film to me. He’s a 2nd or 3rd rounder thanks to his size and athleticism, but his hands hold him back from being a possible 1st round prospect. He’s not a #1 receiver in the NFL, but then again that’s what I was saying coming into this week. Zebrie Sanders, OT, Florida State: I’ll admit I had Sanders graded as a 1st rounder coming into the week but I don’t know if he will end up there considering his performance this week. His lower body strength and his ability to anchor raised a lot of concerns with scouts and evaluators alike, and his inability to finish blocks (especially in pass protection) only added to those concerns. He’s got the size, length and athleticism to play left tackle in the NFL and his stock really rose thanks to his play this year, but he definitely didn’t help himself this week. Left tackles are always in demand, so he may still get selected in the 1st round, but I don’t think he will be the #3 OT off the board. Kelechi Osemele, OG, Iowa State: Osemele didn’t have a good week this week as far as proving his versatility to play outside at tackle at the next level. He had trouble re-directing in open space, he lumbers when he is asked to block on the move, and I don’t think he gets to the second level very well. He is powerful though, even if he isn’t as physical as you might think he would be considering his size. He looked better at guard this week, and his size and length should really help him there. However, if he’s asked to pull or block on the move at the next level I think he will struggle. He showed a lack of versatility this week more than anything, and his only fit is at offensive guard in a man blocking scheme at this point. Vinny Curry, DE, Marshall: Curry had a good game on Saturday which really helped him salvage a less than impressive week, but he struggled during the week in 1 on 1 drills and I don’t think I ever saw him win a match-up with Mike Adams. Adams is a 1st round pick, but he’s also a player with similar ability to NFL starters, and it was troubling that he struggled to beat him so much. He has upside, but he was being discussed as a 1st rounder coming into the week and I don’t think there’s much chance of him going there now unless he has a terrific combine. He struggled to create pressure after he was engaged, though he did flash the ability to do so in the game on Saturday. Alfonzo Dennard, CB, Nebraska: Dennard may have hurt his stock as much as anyone. On top of struggling this week as he showed tightness in his hips as well as a lack of recovery speed he also got injured and wasn’t able to resurrect his bad week with a quality game like Vinny Curry and others did. He has upside, but I don’t think he is a 1st round pick after watching him play this week. He showed a lack of versatility as well, and may ultimately be best in a Cover-2 scheme at the next level where he can press at times, but also react to things in front of him while reading the quarterback’s eyes. Kellen Moore has a very high football IQ and good accuracy but his arm strength and size limit his overall upside as a prospect. Kellen Moore, QB, Boise State: Moore was the superior quarterback in this game and it wasn’t because of his size and arm strength it was because of his impressive football IQ and accuracy. He consistently made good pre-snap reads, flashed the ability to make anticipation throws, and delivered throws with quality ball placement. He threw two interceptions but the first one bounced off of Tyler Shoemaker’s hands for an easy interception and the second one occurred when he was hit as he threw and the ball floated in the air and was easily caught by a defender. He got lucky that he didn’t throw three as he got hit as he threw one other time and the ball floated in the air and an Arizona State defender seemed to misplay it as it fell harmlessly to the turf. Regardless of his interception total Moore was impressive in this game. He still has to transition to playing under center more consistently in the NFL which was partially demonstrated by a fumble as a result of a mishandled snap in one of his few snaps from under center. He also doesn’t do a great job in the face of pressure which was illustrated a bit by his issues throwing interceptions and some other poor passes when Arizona State was able to generate a pass rush against him. He’s a good quarterback with a quick release, good accuracy and a great head on his shoulders which makes him draftable in the 4th/5th round range but he will be limited by his very average arm strength and his lack of elite size. He will get drafted for his accuracy, experience and his football IQ and that will help him stick on a NFL roster as a back-up. If he can develop for a couple years he might get his shot at a primary back-up role which could lead to a chance as a spot starter. You never know what might happen, but I don’t think Moore is going to be an expected starter in his first two or three years in the NFL. Doug Martin is without a doubt the top senior RB in this draft class and if he makes it to the 3rd round I think he will be an absolute steal. 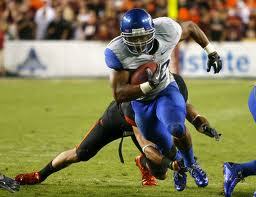 Doug Martin, RB, Boise State: Martin is probably the most impressive 2012 NFL Draft prospect in this game in my opinion. I have a 2nd round grade on him right now and I could see him sneaking into the 2nd round if he impresses in the postseason. He not a tall back at 5’9” but he weighs 208 pounds and looks very strong. He’s got good leg drive, good vision as a runner and as a return man, he runs through arm tackles with ease, has good balance to absorb contact, impressive burst, acceleration, patience, soft hands and he is likely one of the best pass blockers of any of the running backs in this draft class. I think he’s going to be a very good running back in the NFL and he is almost certainly going to end up starting or contributing right off the bat depending on where he ends up going. He’s a complete back and honestly he warrants comparison to another do it all back already succeeding in the NFL: Ray Rice. Tyler Shoemaker, WR, Boise State: I haven’t seen much of Shoemaker this year but he had a solid game tonight. He isn’t a freak athlete at receiver at 6’1”, 212 with a 4.5 40 yard dash but he has solid hands in combination with that size. He did have one key drop tonight that led to an interception, but he produced 954 yards and 16 touchdowns on 62 receptions this year. He warrants late round consideration to be sure, but I definitely need to see more of him before I come to a complete conclusion. Nate Potter, OT, Boise State: Potter always struck me as a guy who would have to slide inside to guard, but seeing him a bit more before tonight has made me reconsider to a degree. I think he could move inside in a zone blocking scheme, but I think his best position may ultimately be at RT in a ZBS. He isn’t a force in the running game and might be overmatched inside at guard in that aspect, but he isn’t an impressive LT in my opinion and will have to shift from that spot to be a quality starter in the NFL. RT is the compromise I think makes the most sense so he won’t be overmatched as a pass blocker or as a run blocker. I’m not sure where I project him right now, but a 3rd/4th round grade makes sense at this point. Billy Winn is a quality defensive line prospect that should be able to play DT in a 4-3 or DE in a 3-4. 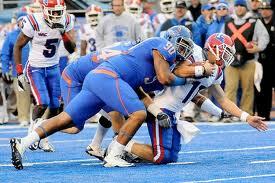 Billy Winn, DT, Boise State: I was very impressed with Billy Winn last year and I am still impressed with him. At 6’3”, 300 pounds he has NFL size and should be able to play defensive tackle in a 4-3 or possibly defensive end in a 3-4. He wasn’t as statistically productive this season but he drew significantly more attention this season after he demonstrated a lot of ability last year. He definitely warrants 3rd round consideration and may very well be one of the players that improves his stock in a postseason all-star game. He’s got upside and I’m excited to see where he ultimately ends up. Shea McClellin, DE, Boise State: McLellin is a quality NFL prospect. I’ve got a 3rd round grade on him right now but he’s got legitimate NFL ability. He’s got an impressive motor along with solid size at 6’3”, 255 pounds. I think he will be a rotational guy for a while, but reminds me a bit of Brian Robison who has found his way into the starting lineup for the Vikings. He had 9.5 TFL and 6 sacks coming into the game against Arizona State and added another sack at least in that contest, and while I don’t think he will be a high draft pick I do think he’s going to get drafted in round three or four. George Iloka, S, Boise State: Iloka is an impressive specimen for a safety at 6’3”, 215 pounds with a 4.5 listed 40 yard dash time. He has never impressed me an awful lot in coverage, but he demonstrated the ability to cover receivers in man coverage tonight against Arizona State which is encouraging. He only had 7 career interceptions including just one over the last two years as well as only 6 pass break-ups over that same time period. Perhaps that is because offenses respected him and didn’t challenge him, but I’m not convinced that is the case. Regardless, he has legitimate NFL talent and projects as a 3rd/4th round pick right now. It will be interesting to see what he does at either the East-West Shrine Game or the Senior Bowl. His performance at either game could be critical for boosting or hurting his stock. Brock Osweiler may have had a tough night against Boise State but he showed plenty of mental toughness and leadership. He's raw but he has a lot of upside. 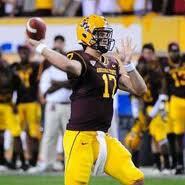 Brock Osweiler, QB, Arizona State: Osweiler is a guy I have been talking up all year since seeing him play months ago. He’s a first year starter and is clearly very raw but he flashes ability that is definitely encouraging. Will he be a 1st round pick next year? Maybe, but it’s definitely not a sure thing at this point. He definitely has that ability but he hasn’t been consistent enough yet to be considered a lock in that regard. He has great size at 6’8” and a rocket arm but his accuracy isn’t always what you would want it to be, his throwing motion could use a bit of tweaking and he doesn’t have a lot of experience as a starter. He needs to learn to make better pre-snap reads and being able to compare and contrast his game with Moore’s was very interesting. Moore relies upon his smarts and his ball placement to succeed whereas Osweiler is more reliant on his physical tools like his size, athleticism to extend plays at times and his rocket arm strength. As Osweiler learns to move in the pocket better, make better pre-snap reads and hopefully improve his accuracy a bit he will be a very good QB. His accuracy is good right now, but it could be improved especially if he continues to drill his footwork. I’m not sure what impact having a new coaching staff at Arizona State will do for him, but hopefully it has a positive impact and not a negative one. If it has a positive impact then Osweiler could be in the 1st round conversation next year. Gerell Robinson, WR, Arizona State: Robinson has had a great season and most people didn’t know a thing about him before this year. He was easily Osweiler’s go-to receiver and while he didn’t always make the play he consistently came up with a 3rd down catch or a big gain downfield to extend drives and provide a spark to Arizona State’s offense. He has legitimate NFL prospects due to his 6’3”, 222 frame and his 4.58 40 yard dash time. He won’t be a burner in the NFL and some of the vertical plays he was able to make at Arizona State won’t be as realistic against more talented, athletic corners than he faced in college this year, but he has plenty of upside as a possession receiver due to his impressive size. He’s got reliable hands and consistently makes catches in traffic so even if he doesn’t create elite separation at the next level he can still produce. Additionally, he has the size and hands to be an effective red zone target which increases his value. Finally, he also seems to be a pretty willing blocker which with coaching could make him even more valuable. I have a 5th round grade on him right now, but it will be interesting to see if he gets any postseason love from the East-West Shrine Game or maybe even the Senior Bowl. I’d love to meet him down there and interview him considering how much I have watched him this year as a result of taking a look at Osweiler and Vontaze Burfict. Mike Willie, WR, Arizona State: Willie is the less impressive starting receiver for Arizona State. He was in Robinson’s shadow all season this year but I think he has the potential to make a team either as a very late draft pick or as an undrafted free agent. He has solid size at 6’2”, 212 pounds, a listed 40 yard dash time of 4.59 and solid hands. He didn’t play as well as Robinson did this year, but I think he could still make a roster, contribute on special teams and eventually get worked into a rotation. He’s never going to be more than a 4th/5th wide receiver on a roster, but he could contribute as a possession type receiver on 3rd down and in the red zone. The trouble is there are plenty of those types of receivers available and the NFL is looking for big time playmakers and Willie just isn’t one of them. That hurts his stock. Rashad Ross may not have had glamorous numbers as a junior but he contributed much more late in the season and is my early favorite to be Osweiler's new go-to guy next year during his senior year. Rashad Ross, WR, Arizona State: Ross is listed as a DB on the depth chart I’m looking at for Arizona State but he has come on late in the season as a wide receiver and as a return man in light of Jamal Miles’ absence. He only had one reception for nine yards against Boise State but he absolutely burned a Boise corner on a double move and may have scored a touchdown if Osweiler had been able to get the ball off despite Boise State’s pressure. Regardless, he had a significant impact on the game as a return man by returning the opening kickoff of the 2nd half 98 yards for a touchdown to briefly give Arizona State some momentum and a chance at a comeback. At 6’0”, 174 he doesn’t resemble three of the top receivers on Arizona State who are 6’2” or taller and profile as possession type receivers due to their large frames. Ross may be 6’0” tall but he is very skinny but has great speed to threaten vertically. He produced 16 receptions for 241 yards and one touchdown in Arizona State’s final seven games after only totaling two receptions for 13 yards and zero touchdowns in their first six of the season. I think he has the upside to return as a senior as Osweiler’s future go-to guy much like Robinson did this year and with his speed and burst I think he could have a huge year next year. I’d like to see him come back at 175+ to help keep himself healthy for a full season, but his speed and playmaking ability should be on full display for Arizona State next year. Keep an eye out for him. Garth Gerhart, C, Arizona State: Gerhart is a solid but not spectacular center prospect. This interior offensive line class is pretty strong this year, especially if a couple juniors declare, so Gerhart may not go as high as he would in other years. However, Gerhart has the potential to get drafted in the 5th round range, make a NFL roster as a back-up, and eventually work his way into the starting lineup. He’s a very experienced player, he’s a good snapper, and while he won’t be able to handle a defensive tackle one on one very often he definitely profiles as an eventual NFL starter. He reminds me a little bit of Todd McClure because of his lack of ideal size but in spite of it he was an effective starter for multiple years. I don’t know if his football IQ and intangibles are as impressive as McClure’s, but if they are then I wouldn’t be surprised if he was a starting NFL center in a few years. Jamaar Jarrett, DE, Arizona State: Jarrett isn’t a stud defensive end and he may not get drafted before the 7th round if he is drafted at all, but I have a feeling he will make a NFL roster somehow. He has quality size at 6’5”, 262 pounds and looks like he can add weight to his frame. He has a less than impressive listed 40 yard dash time of 4.90 which makes sense because he isn’t a pass rushing menace by any means. However, he is solid versus the run and has a quality motor which he demonstrates when pursuing from the backside and making stops downfield. His best bet may be to bulk up to 280+ and attempt to stick as a 3-4 DE, but regardless I think he has a NFL future as a back-up somewhere. Will Sutton is only a sophomore and is a bit undersized judging by his listed weight but he has been consistently disruptive all year and I expect big things from him as a junior. Will Sutton, DT, Arizona State: Sutton is only a sophomore defensive tackle but he has plenty of upside. He was incredibly disruptive tonight against Boise State and he got a number of clean hits on Kellen Moore and was responsible for one of his interceptions by hitting his arm as he threw. He isn’t the biggest guy as he is listed at 6’2”, 270 pounds but he definitely looked bigger than that (in a good way) against Boise State tonight. I would not be surprised to see him up to 285 by the time his junior year comes around next season. He may not be the biggest guy but he definitely has impressive burst and quickness and flashed some hand usage to disengage from blocks to pressure Moore consistently tonight. He is definitely an impressive player and while the stats haven’t shown it yet he was one of the rare consistently disruptive forces on Arizona State’s defense this year. Look for him next year, I think he might be ready to explode on the scene. Vontaze Burfict, ILB, Arizona State: Burfict is a pretty polarizing player and it’s not hard to see why. He consistently pisses people off with dumb penalties like late hits on a quarterback or on players running out of bounds and he has a bad boy reputation. I don’t know exactly why he was benched late in the season, it may be for a variety of reasons, but one of them I heard was that he refused to go back in the game after he was benched temporarily late in the season. I can’t confirm that, but it was mentioned on the broadcast tonight if I remember correctly. It’s frustrating because Burfict has great NFL size for a middle linebacker at 6’3”, 250 pounds but given his proficiency for dumb penalties on the field and for getting in some fights with teammates off the field in the past it might be hard for some teams to look past his issues to consider him a quality prospect. Now, he isn’t a first round lock because of his size and athletic ability and there are holes in his game, but it will be interesting to see if he declares after his rough season or if he comes back next year to try to make a run at the Pac-12 title with Osweiler at the helm under new coach Todd Graham. I wouldn’t be surprised if he left, but if he does he will have to answer a lot of tough questions about his behavior this season. Some of it is very warranted, but I personally believe he is targeted for personal foul penalties more than even Nick Fairley was last year because of his reputation. I spent a lot of time watching Arizona State this year (partially because I wanted to see Osweiler and Burfict, partially because they are usually on late so there was no other football to watch) and while some of the penalties he drew were legitimate there were definitely times when he drew a penalty for a clean hit that I personally don’t believe should have been a penalty. However, because it was a hard hit or because it was a 50/50 call or no call play the refs threw the flag. That has everything to do with his reputation. Burfict acknowledged the penalties and attempted to back off and not play with as much intensity to avoid the fouls but refs still called him for penalties that I didn’t believe were legitimate. That likely contributed to him boiling over and getting benched. I can’t say that for sure, but that is my take on the whole matter. I believe the personal foul penalties have been severely overblown, but his reaction to them and his attitude issues at the end of the season are definitely concerning. His upcoming decision to go or stay will say a lot about his true character in my opinion. If he has character and wants to win more than anything he will likely come back to try to help his teammates win, but if he is selfish like many claim he is then he will leave to chase money and avoid more possible conflict at Arizona State. We will have to wait and see what he does. Shelly Lyons, OLB, Arizona State: Lyons is a late round OLB prospect that could very well go undrafted, but I think that his combination of solid size at 6’2”, 228 pounds, reliable tackling and solid coverage warrants at least 7th round or undrafted free agent consideration. I think he could be a quality special teamer that eventually finds himself as a back-up on a NFL roster. I’m not sure he will ever be a starter, but he can make a career out of being a special teams player if he wants to at least in my opinion. Eddie Elder, S, Arizona State: Elder is a quality tackling safety but I have not been impressed with him in coverage over the last two years. He isn’t a big guy at 5’10”, 185 pounds and doesn’t project as a starting NFL safety but like Lyons I think he warrants late round or priority free agent consideration because of his tackling and his ability to potentially contribute on special teams. Clint Floyd, S, Arizona State: Floyd may end up like Elder as a late round pick or a priority free agent addition but I think he has a bit more ability in coverage than Elder does. He has similar size at 5’10”, 194 pounds which hurts his NFL prospects as a safety but he seems to be a solid tackler and looked alright in coverage tonight even though he got lucky with his interception. He will likely end up trying to make a roster as a special teams player as well, but I think he has the potential to make a career out of that and being a back-up safety. Why: BYU is surging into the bowl season after a slow start to the season while UTEP started strong and backed into the bowl season by finishing with just one victory in their last six games. Key to the game: UTEP’s senior QB Trevor Vittatoe is the key to UTEP’s potential victory. In the last six games, of which they lost five, Vittatoe threw eight interceptions and only five touchdowns. Three of those five touchdowns came in their only victory against SMU. If Vittatoe can have an efficient game against BYU then UTEP could be poised for an “upset” of sorts. Why: Despite losing their coach NIU is one of the best running teams in the country, and that running game should help their QB Chandler Harnish find passing lanes, especially with play action. Key to the game: NIU’s QB Chandler Harnish. I was tempted to name their RB Chad Spann the key player in this game, but Harnish’s ability to throw efficiently (2,230 yards, 64.7% comp and 20 TD’s to only 5 INT’s this season) along with his ability to gain yards with his legs (764 yards and 5 TD’s) he needs to perform well and threaten Fresno State with his arm and his legs for them to win this game. If he plays efficiently they have a great chance to win. Why: Troy’s QB Corey Robinson may turn the ball over a fair amount, but he was productive with 3,300+ yards, 24 TD’s and 15 INT’s. Ohio’s QB Boo Jackson managed only 15 TD’s and 16 INT’s comparatively. Troy is a little more one dimensional with the pass, whereas Ohio’s offense is more balanced but not as explosive. This could be a bit of a sloppy game because both QB’s are relatively prone to turnovers. Key to the game: Jerrel Jernigan, WR, Troy. Jernigan has had three consecutive seasons with 70+ receptions for Troy and has again been a favorite target of freshman QB Corey Robinson. He is an explosive receiver, and if he can get behind Ohio’s secondary he could have a big game. If they keep him relatively contained he could still have an impact because of his reliable hands. Why: Louisville has a balanced offensive attack that has enabled them to go from QB to QB depending on injuries and still have relative success. Their defense is much stronger overall than it was when Petrino was there, so if they can muster a balanced attack against Southern Miss they should have a good chance to win. It will be interesting to see how their defense holds up against Southern Miss. Key to the game: Bilal Powel, RB, Louisville. Powel is the heart of their offense and he is the feature back of their offense. When Powel has 90+ yards and one or more touchdowns Louisville has won or been in very close games in every week, so if he plays well Louisville tends to be in a position win. Why: I personally think Utah is very overrated, but besides that Boise State is a very balanced team. They have a great passing attack led by Kellen Moore, one of the most efficient and accurate passers in the country, as well as an underrated running game led by Doug Martin. Their defense is as good as it has ever been, and between that and their juggernaut offense I think Utah will be over-matched. Key to the game: Utah’s running game. If Utah can run the ball and sustain drives it will keep Boise State’s high-powered offense on the sideline. If they try to get into a shootout with the Broncos they will lose, so they have to try to slow the pace of the game down in my opinion. Why: San Diego State is a more balanced attack than Navy. They have two talented WR’s in Vincent Brown and DeMarco Sampson, a quality passing QB in Ryan Lindley and a quality running back to rely on in the running game. Navy’s offense revolves around their QB Ricky Dobbs. He is their best passer as well as their leading rusher for Navy, but San Diego’s run defense may be capable of slowing him down. If they do, and if they get ahead of Navy, they may not have the offensive firepower to play from behind. Key to the game: Ricky Dobbs. If he plays well, helps control the clock and keeps San Diego State’s offense off the field then Navy can win. But if San Diego State slows him and Navy’s offense down then San Diego State will have an easier time winning this game. Why: The Golden Warriors have an extremely potent passing offense like they always seem to have, but this time around they have a quality running game to attempt to balance out their high-powered offensive attack. Tulsa has a potent offense as well, but I don’t think they can win in a shootout with Hawai’i, hence why I give them the advantage. Key to the game: Defense. It might sound simple, but whichever defense plays better overall will give that team a substantial advantage. Both have pretty good defensive backfields, so if one of them steps up and potentially creates some turnovers that team would gain an advantage. Why: Toledo’s QB’s are much more efficient than FIU’s, even their redshirt freshman Terrance Owens who stepped in after their original starter, Austin Dantin, went down to injury. Toledo also played better competition and I think they are more prepared for this bowl game than FIU. Key to the game: Terrance Owens, QB, Toledo- If Owens continues to play efficiently like he has since stepping into the spotlight then Toledo stands a great chance to win. But if he plays like an inexperienced freshman then Toledo will be in trouble. Why: Georgia Tech’s defense is fast enough to slow down Air Force’s ground attack, and I think they are disciplined enough to do so also. But I am not sure Air Force is up to stopping Georgia Tech’s offense. Both teams are great at running the football, but ironically it might come down to whoever hits on a deep ball or two who comes away with a victory. I think that Georgia Tech has that potential with Stephen Hill. Key to the game: Josh Nesbitt. Nesbitt is an interesting key to the game because he may or may not play as a result of his injury suffered in early November. He has not yet been cleared by doctors, but if he is healthy enough to go I would be shocked if he doesn’t play. He is the heart of Georgia Tech’s rushing attack and without him they just aren’t as effective. If he plays Air Force will have a lot to stop. Why: West Virginia’s offense is potent and it is led by sophomore Geno Smith who has had an extremely efficient season. Their offense is explosive and can score quickly or piece together a methodical drive with a dose of Noel Devine and Ryan Clark running the ball. NC State has a quality QB and a couple of nice receivers to throw to, but West Virginia’s defense is great at rushing the passer and I think they will force Russell Wilson into a couple potential mistakes. Key to the game: West Virginia’s pass rush. If West Virginia can rattle Russell Wilson, force him into mistakes but also keep him inside the pocket so he can’t extend plays by scrambling or finding receivers on a broken play then they should have a pretty easy time beating the Wolfpack. Why: Iowa won’t have Adam Robinson or Darrel Johnson-Koulianos against Missouri as a result of suspensions which will hurt their offense. I think Ricky Stanzi might have it in him to still pull off a win if he plays like he did late in games all last season, but I don’t know if he can do that this year. Not only that, but Iowa’s defense will be challenged by a potent Missouri defense and a quality QB of their own. Blaine Gabbert isn’t a great QB but he is a good one, and I don’t know if Iowa has the secondary to stop Missouri’s passing game. I also think that Missouri’s offensive line has a solid chance of slowing down Iowa’s very talented defensive line, which could make it a long day for Iowa’s defensive backs. Key to the game: Iowa’s pass rush. If they get after Gabbert and can force him into mistakes then I think Iowa will in the game. But if Missouri slows down Iowa’s pass rush and gives Gabbert time to throw I think Missouri will ultimately win the game. Let’s hope these predictions go alright! I for one am ready for one last round of college football! Enjoy! Thanks for reading!